Now, just last week I saw a pair of SansAmp units at a secondhand store that looked pretty much like this, except it was achieved with good old-fashioned irresponsible mistreatment, not precise relicing. I know some I Heart Guitar readers are dead against the idea of relicing, so what do you think of this? In celebration of their 20th anniversary, Tech 21 is releasing a special relic-style version of their SansAmp Classic. 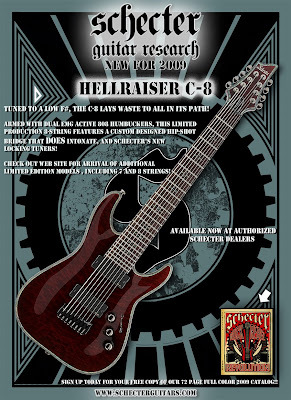 The exterior design is taken from an actual “vintage”SansAmp pedal used on a world tour by a renowned artist. The main heart of the circuitry and inner workings remain virtually unchanged. 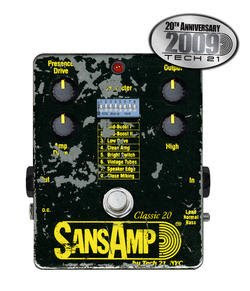 The SansAmp Classic pedal is B. Andrew Barta’s innovative invention which debuted in 1989. It’s a little known fact that Barta never intended on becoming a manufacturer. He initially tried selling his technology to some of the major manufacturers, but was turned down. Unable to abandon his idea, Barta formed Tech 21 and set out on his own. In spite of the fact this kind of product had never before existed, it took a surprisingly short amount of time to gain acceptance. Players simply had to hear it. Players like Mick Jones of Foreigner, who, early on, helped Barta get the word out. The rest, as they say, is history. Tech 21 pioneered the direct recording movement and was responsible for creating an entirely new category of signal processing. Barta’s proprietary, 100% analog technology captures the warm, rich, natural tones of the most sought-after tube amplifiers. SansAmp can be used with almost any instrument, for any music style, and for multiple applications in the studio as well as live performances. Currently, the SansAmp is available in 15 different models, including 5 in their SansAmp Character Series released in 2008. Of the pedal formats, SansAmp Classic is the most sophisticated. There is a bank of eight Character switches to adjust tonality, harmonics and dynamics; a 3-position input switch offers a choice of pre-amp styles; and four knob controls to shape pre-amp contours, power amp contours, volume and final tone. Manufactured in the U.S.A. MSRP: $375.00. Contact Tech 21 USA, Inc., 790 Bloomfield Avenue, Clifton, NJ 07012. Tel:973-777-6996. Fax:973-777-9899. E-mail:info@tech21nyc.com. CLICK HERE to buy the standard, non-relic Tech 21 SansAmp GT2 Tube Amp Emulator from Musician’s Friend. I’ve been using a Bob Bradshaw-designed MXR/Custom Audio Electronics Boost/Overdrive for about six months now with my Marshall JCM2000 DSL50. I set the amp’s gain levels relatively conservatively, then hit the preamp with increased output from the boost when required, so I have 4 levels of gain across 2 channels. Then I stomp on the overdrive section if I need even more gain. The latest from the CAE/MXR collaboration is the MC-404 CAR Wah. I can’t wait to try this one, and maybe add more sweet CAE/MXR gear to my pedalboard. The MC-404 CAE Wah was developed by Bob Bradshaw of Custom Audio Electronics and the Crybaby design team with the goal of creating a highly versatile wah-wah of top-grade components. It features dual Fasel inductors with two distinct voices (high-end emphasis or low to mid resonance), and a built-in MXR MC-401 Boost/LineDriver adds even more flexibility. Choose between inductors and turn the boost on or off with the side-mounted kickswitches; bright LEDs on each side of the wah indicate operation status. The MC-404 boasts true hardwire bypass, a long-life CTS potentiometer, and internal pots for “Q” and gain adjustments – high performance and quality that you can only expect from Dunlop, the world leader in wah-wah technology. CLICK HERE to buy the MXR Custom Audio Electronics MC-402 Boost/Overdrive Pedal from Musician’s Friend. CLICK HERE to buy the MXR Custom Audio Electronics MC-401 Boost Pedal from Musician’s Friend.